Fits chain link fabric and 1-3/4" - 2-1/8" width U-posts. For U Posts & chain link fence. Holds wire 3-3/4" from post. 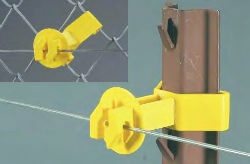 Solid wire holders take smooth, barbed and polywire. Molded of high density polyethylene with UV stabilizer for all weather performance.